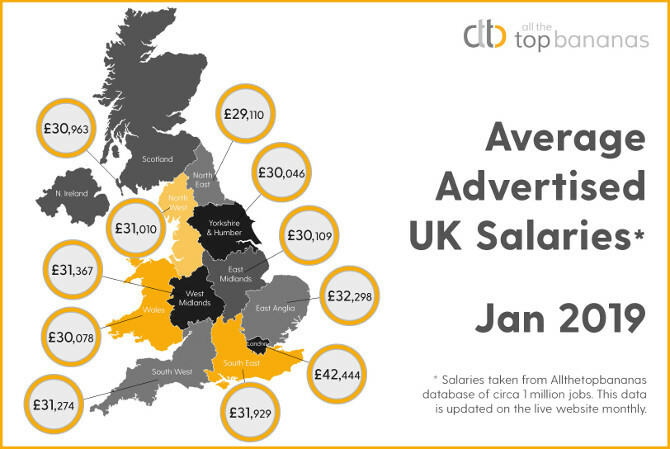 January’s stats for average advertised salaries are in and it appears the climate is getting tougher for much of the UK. Comparing January ’19 with December ’18 on www.allthetopbananas.com London continues to perform the strongest with an advertised average of £42,444. For the rest of the UK though, there appears to be less when it comes to wages in January than in December. However, East Anglia and the East Midlands both continue to be slightly on the up compared to December. East Anglia has the second highest average of £32,298, while the East Midlands offers an average of just over £30K. Head of Marketing at Allthetopbananas.com David Ogden said: “There’s been some big changes in the last couple of months, particularly for Wales. It will be interesting to see how Wales and all the regions develop with the UK’s proposed EU exit date of 29 March just around the corner”.